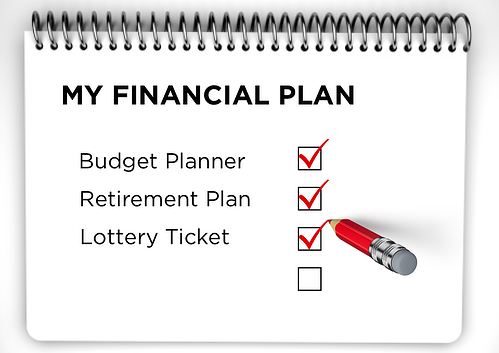 Why do 21 percent of employees include the lottery in their retirement plan? Today's post is about the lottery. Shocking fact of the day: a recent study claims 21 percent of employees see winning the lottery as an important part of their wealth-building strategy. I couldn’t believe this at first - how absurd to see the words ‘lottery’ and ‘wealth-building’ in the same sentence. Then I thought about why people play in the first place and is there anything we can learn from those that include the lottery in their financial plan? The chances of winning the jackpot are one in 125 million, so there is no doubt that placing all your eggs in the lottery basket is off the high risk scale as a retirement plan. But as the balls are rolling around the machine and popping out the end, there’s something quite exciting about it, isn’t there? And if you don’t win, isn’t there something quite nice about knowing you’ve got another chance to win in only seven days time that feels quite good? And how easy is it to understand? Match 6 numbers to 6 balls, far less complex than enrolling in my work's retirement plan. When the world of financial planning brings to mind boring budgets, complex terms and things I have to do now that I won’t benefit from for 30 years, is there something quite appealing about the lottery? It's fun, it's easy, it's exciting, it's right now. Yes the retirement plan is important, but in a society which thrives on instant gratification and wants everything now we need to support the shorter term financial goals as well. That could be paying for the holiday of a lifetime before having kids, re-doing the kitchen that’s in desperate need of a makeover or buying a second property. Having goals that are in arm’s reach keeps us focused, makes us feel good when we achieve them and ready to tackle the next one. And with 83 percent of employers saying their staff do not fully use or understand the benefits available to them, is there a way of educating your employees on their retirement plan so it’s as easy to understand as matching 6 balls to 6 numbers? And is there a way of making it fun? Something you look forward to every week? Living in New York City you can feel when there is a buzz in the air, whether it’s from the Rangers making it to the finals, the election of a new mayor, or when the lottery jackpot sky rockets. I’ve seen lines around the block, participated in office pools, and talked with friends about what we’ll do with the winnings. What can we learn from this kind of feeling created by the lottery and apply it to financial and retirement planning? Or are ‘financial’ and ‘fun’ just like ‘lottery’ and ‘wealth-building’? Two words that don’t belong in a sentence together. Do your employees have a retirement plan beyond winning the lottery? Share your thoughts below. Shelley Packer is the Global Head of Sales. She loves to support people in their career development and (unrelated) is a black belt in karate.